What makes an Avatar look professional? In activity 7 of the current MUVenation session, we are asked to reflect on an consider our and our students’ perceptions of appearance in Second Life teaching settings. I answered some of the questions in my previous post as a reaction to a forum discussion but will address some of the questions given in this activity. Do you think avatar appearance is an important aspect of educational activities that are being undertaken in Second Life? What is a appropriate professional avatar appearance for education? A lot depends on the nature of the course. Appearance in an art or design course, will matter more than in a language or philosophy course, I assume. But even in courses where appearance is not the focus, out of the ordinary outfit or avatar shapes might not be appropriate. They might be simply distracting, seen as immoral, not serious looking enough, too serious looking or unfitting in an educational setting. Reasons for seeing a certain appearance as unfitting can be related to different cultural norms, religious believes or expectations about and knowledge of Virtual Worlds (game? serious?). In general, I would say that extremes in whatever direction should be avoided both by teachers and students and more so at the beginning of a course or with participants who are new to Second Life. Does your avatar have a professional appearance for educational contexts? Yes, no? Why? Again, what professional is depends on the kind of educational context. As a free-lance language teacher working in-company as well as doing private tutoring, I am very flexible regarding my outfit and usually wear more casual clothes, which is seen as appropriately professional where I taught/teach. This is also the way I dress in Second Life. Although, in SL I often tend to look more formal and often wear dresses which I almost never do in RL. This has partly to do with my not being able to find the kind of appropriate clothes that I am looking for. Is there any appearance you would never use to teach in Second Life and why? Yes, I would not appear in anything that reveals (too much) skin. This is based on my religious believes but also on what is considered inappropriate for teachers in Germany as well as Turkey. I would also not appear as a very unusual avatar (animal, robot, etc) if it is not part of the lesson, in order not to become the centre of attention as the teacher. 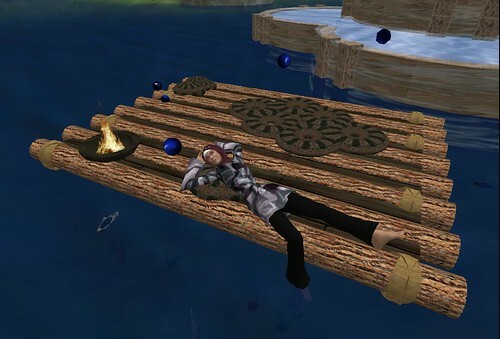 The ability to change avatar appearance could be described as an affordance of Second Life. How can the ability to alter avatar appearance be used as a teaching tool? Looking at it from a language teaching/learning perspective, being able to change the avatar’s appearance is a wonderful “tool” for role-play activities to make avatars feel and look more real and thus help to find into one’s role. I can imagine many activities like “describing an avatar to practise colours, shapes, and other adjectives and descriptive language”, “showing one’s favourite outfit and telling why – similar to “show and tell” activities at schools”, etc. I could even imagine to have a session about “What is an appropriate outfit for a student/teacher in SL/RL” kind of discussion like I am writing here about. I would have such a session at the beginning of a course to find out what expectations students have and might try to dress accordingly within my own limits and comfort-zone.